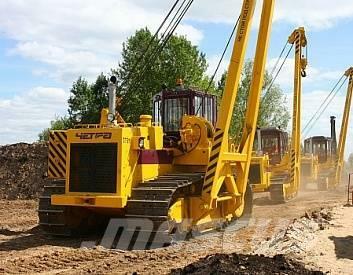 Додаткові інформації Pipelayers "CHETRA" can be operated in climatic conditions from -50 to +50 degrees С. The machine is equipped with an electro-hydraulic hydromechanical transmission. Compared to previous models, the new design features have significantly increased the running gear system life and reduced maintenance labor intensity. To expand the climatic zones of use of the pipelayer, a detachable connection between the cabin module and the platform of the workplace was used. The management of the tractor and its systems is completely electronic. Electro-hydraulic method of controlling lifting equipment. The new ONK-160 security apparatus. There is even a “black box” for recording the operating parameters of lifting equipment, an emergency hatch. Arrow: welded square tube design. It is driven through the polyspast system using a two-speed winch. Arrow length - 8.9 m.
Winch: two single-drum, hydraulically controlled, have permanently closed disc brakes. Mass counterweight with frame - 11710 kg.